Nursery Staff at Brook Green Nursery. Brook Green Nursery is open term time and run by a dedicated and enthusiastic manager, along with five experienced full-time staff members. We have one of the best and biggest outdoor play area in the neighbourhood. We provide a happy, caring and safe environment for children. Nora Lafhaj – Nora has been Brook Green Nursery manager since July 2008. She started in 2006 as a volunteer/student and completed her NVQ in children’s care, learning and development Level 4. She is also the nursery’s SENCO (Special Educational Needs Co-Ordinator). Nora loves lazy weekends, being a grandma, reading and long walks. Her role at the nursery is to support the team as a whole as well as each staff member individually to achieve their targets and goals. Nora supports each staff member with their key children, and together they help the children move forward in their development. She also supports the staff with planning for the environment, making sure all areas of the Early Years Curriculum are being met. With the help of the committee, she is responsible for health and safety, safeguarding, keeping up to date with legislation, updating policies and procedures and training. On the business side, Nora and the committee also oversee the accounts, fees and filling up the nursery places, as well as ensuring the smooth running of Brook Green Nursery Ltd. Nora’s long term plan is to continue to raise standards in the nursery. 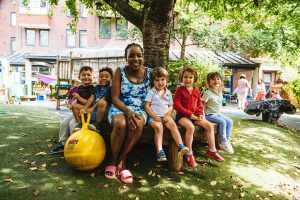 Myriam Edoh – Myriam joined Brook Green Nursery in 2016 and is currently Deputy Manager. Besides supporting the staff and manager, Myriam ensures that all the children comply with the Early Years Foundation Stage and achieve their cognitive development and milestones based on the Early Years foundation. She trained and worked as an engineer, before changing career path and graduating with an Early Years Teacher Status (EYTS). Myriam speaks two languages – French and English. At the nursery, Myriam also supports children with special needs and is responsible for French lessons. In her spare time, Myriam enjoys cooking, music, dancing, shopping, reading, yoga, travelling and games. 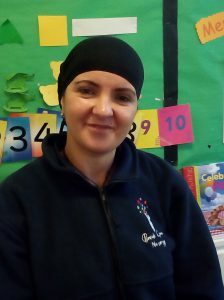 Aicha Roundi – Aicha joined Brook Green Nursery in 2018. She has a cache level 2 and 3 Diploma for the children and young people’s workforce (QCF). She also has an Arts foundation degree, having followed an approved programme in Early Years, and a U.C.L Bachelor of Education with second class honours. She has more than 8 years of experience working in primary schools. Aicha speaks English, Arabic and French. In her spare time, Aicha enjoys spending time with her family (two boys and two girls) and traveling whenever she can. She has visited lots of places in Europe! 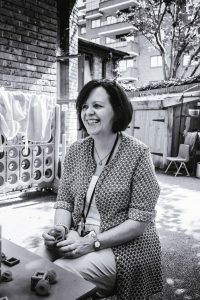 Zoe Everton – Zoe began working at Brook Green Nursery in 2018. She has a level 2 Diploma for the children and young people’s workforce (QCF). Zoe has worked previously in a nursery for 8 years in a supervisory role. Zoe has a gym membership and enjoys also reading, visiting museums and spending time with her daughters.